Anyone who is close to me will know how deep my love goes for designer handbags. 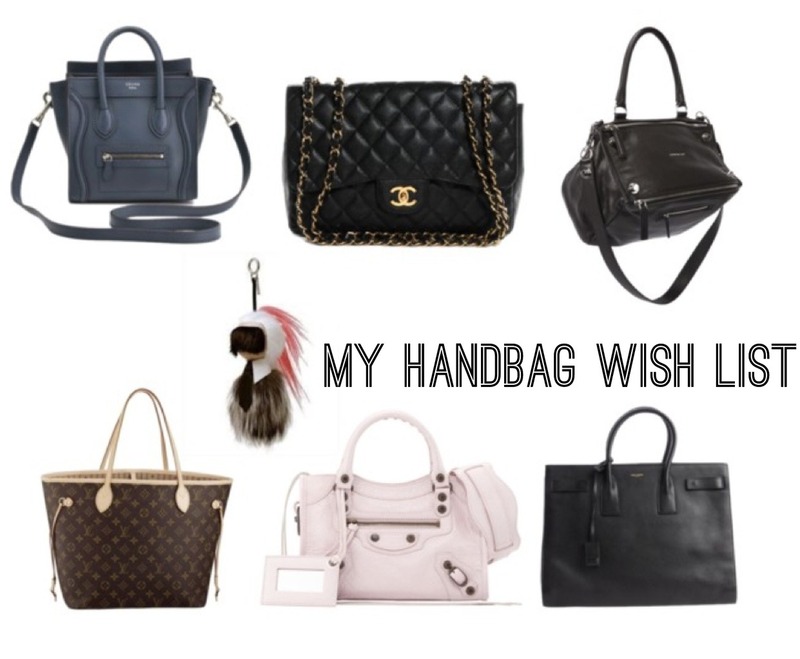 Some people don't understand why a person would spend so much money on a handbag, but if you have the means, why not? People have different tastes in what they like to collect, whether it is expensive or not, and handbags is my thaaang. 1. Celine nano luggage // I'm usually a big bag kinda gal, but for some reason, Celine's bigger luggages don't appeal to me as much as the nano does. I feel the nano is the perfect size of being able to carry a good amount of things while still remaining a small size. It's good for days where you're not bringing much and it matches with everything. The shape and the way it hangs when worn is so effortless and beautiful. 2. Chanel Jumbo Classic // Every girl has got to have their own Chanel bag. I have been eyeing on this one for years and I am trying to make this dream come soon since the price on designer bags are always rising as the years go by. I like the biggest size because I want to use it as an every day bag, allowing me to fit as much as I can inside. I do also like the smaller sizes, but the jumbo size appeals to me the most. Maybe after I get the jumbo, I'll get the smaller one when I am much older. 3. Givenchy Pandora (mini/small) // I really like how this bag hangs when worn, but am unsure of whether I'd prefer a mini or a small. This isn't one of my top-top choices so I'm not really too concerned or worried, but who knows. Maybe in a few months, I 'll change my mind and this will be the bag I will desire much more. 4. Louis Vuitton Neverfull // LV isn't always my first go-to place when thinking of handbags, but the Neverfull is definitely a lovely bag. A lot of people argue that too many people have it now, but who cares? It's about you, not them. If you like it, then get it. You make it work for you. I love how much it holds and how durable it is. It really matches well with a lot, too. 5. Balenciaga city mini // I saw a girl in Saint Tropez this summer wearing a mini and I loveddddd it on her. It looked so good, so classic, so chic. This isn't on the top priority list either, but if I could, you know I would. 6. Saint Laurent Sac Du Jour (medium) // Ever since seeing Youtuber +Weylie Hoang wearing this in her vlogs, I loved this bag. She wore it really well and it is such a classic, simple piece that seems to be good for so many occasions. I'm always happy if there's a strap since I like wearing bags on my shoulder more than on my arms. That's way too tiring. I need my hands for my cellphone and a nice venti sized passion fruit sweetened iced tea from Starbucks.